Marklews Pond today is clear, peaceful, limpid and surrounded by wildlife and greenspace. A far cry from its industrial past. Just wondering if anyone can give me info about Marklews Pond off Coppice Lane. I’ve fished there for 20 years. Now I see a sign saying ‘Private Fishing. Little Wyrley Estate’. Does Marklews Pond now belong to a fishing club, or is fishing not allowed at all there now? I think its a cracking little pool with some good carp and tench… It would be sad not to be able to fish it anymore. I know nothing at all about angling, so I’m throwing this out there for readers who do, and I’m sure there are a few out there. It is somewhat curious, and I’ve often wondered who owns the pool. 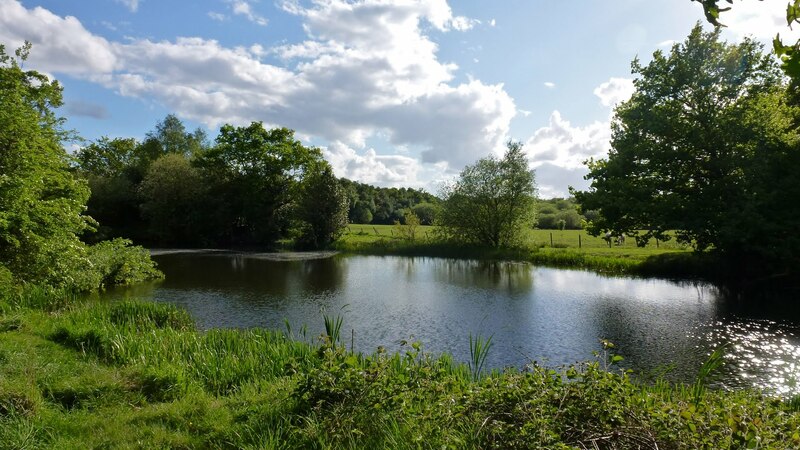 If you want to know something of the history of the pond, see this post here – it was once a marl pit for a brickworks! Thanks to Taffy for an interesting and unusual enquiry. 2If you can help, please do – either comment here or mail me – BrownhillsBob at Googlemail dot com. Thanks. This entry was posted in Brownhills stuff, Environment, Features, Followups, Fun stuff to see and do, Local Blogs, Local History, Local media, Panoramio photo discussions, Shared media, Shared memories, Social Media, Spotted whilst browsing the web, Walsall community and tagged Brownhills, Brownhills local history, Bug row, colliery, Common, Coppice, Coppice Side, Engine Lane, Internet Archive, little Wyrley, local blogs, Local History, Marklew's Pond, Old maps, Panoramio, Robert Webster, Side, Staffordshire, state, taffy, Tommy Shop, Tommy Tokens, Wayback Machine, William Marklew. Bookmark the permalink. 19 Responses to Something fishy afoot? The pond is owned by little Wyrley Estate, and has had these signs up on previous occasions i once got into a lengthy discussion with the council about getting the place tidied up a bit after a Gypsy incursion. The council said they could not help me with the maintenance of the pool as it was the responsibility of Little Wyrley Estate. There have been a few privateers who have took it upon themselves to manage the pool previously. I am not sure they ever had permission from Wyrley Estate, but that would have to be verified. We continued fishing it and asked the people involved to prove their position as pool managers, it was never proved. As long as I have ever known the pond has belonged to Wyrley Estate and a licence is required to fish there… Im shocked that anybody has been able to fish without a licence and got away with it as there as there is a guy called Carl Griffiths who looks after the pool intensely as his own but does a very good job to be honest…. A licence is different to a permit from the owners, you have to have a licence to fish anywhere and I would imagine Taffy has one. I think hes more asking about a permit to fish which is usually supplied by the owner of the water. Seems like its an open water from what your friend has said so Taffy can carry on fishing his favourite pool. Stevie, that pool has been fished long before you ever knew it was there. I am 50 and have fished on and off up there for 40 years. I fished there regularly from about 1945 until the mid fifties and then paid the occasional visit in the early 1960s. I have a lot of happy memories of my time there, the Marklews’ still farmed in the earlier days. There was never any mention of a permit in those days. There were some good sized Pike in there and I once saw one take an adult duck. I don’t fish any more but I have often thought of one more visit. i worked in a property near the police station some years back where a gentleman gave me an account of a suicide that took place in the pond. His dad was a P.C who led the search for the man who drowned himself in Marklews pond. I wonder if there is any record of that? Thanks, Woz, I’ll have a look. Lots of such suicides (yeah, lots) in the years from the 1890s-WW1 in Norton Pool (Chasewater) – it’s quite remarkable when you study the archives. i remembered this morning, the P.C was a “P.C Marklew”. The family name was got us talking about the pond. I find it hard to believe there being double figure tench in there , may be the one that got away ??? Personally iv been lucky enough to catch 2 of them , an there a huge fish indeed . Did you see these fish weighed correctly ? an im sure if one was caught would be fish of lifetime an phoographs would be taken ? perhaps taffy could comment on this as fishes there regular . I would think in reality the tench are 2 to 4 pounds . My double figure tench were caught from another venue 25 miles away . I have spoken to WMBC and they have said that there are no restrictions to fish Marklews pool. The pool is owned by Wyrley estates but the pool is situated on the Brownhills common land. Even though the land is owned by Wyrley estates and also maintained by such it is still Brownhills common. This land was handed to the parish of Brownhills many years ago for the “Free enjoyment” of the people. This means that we as residents are allowed to freely roam the land and no permit it required. As for marklews pool this is also free fishing. Members of the wallace family have walked the common for years and have never had any issues with people fishing the pool so thats good enough for me. so feel free to fish, have a beer as we all like to do when on the bank but always take the litter home. Having studied fish biomass of pools I would say marklews pool is less than an acre . The facts indicate in a natural state per acre of water it will only support 300 pound of fish per acre rising to maybe 500 pound of fish in a commercial situation . So lets hope the people responsible for illegally moving carp from water to water do not descend on this pool , an upset the natural balance of the pool , an its native tench an roach stocks . It is well documented a water is only capable of supporting so many fish . Also the more fish put in they get stunted an grow smaller , less fish produces higher average size . Most importantly a healthy water contains weed , a water with no weed contains less food , so like it or not clear water an weed is good for a fishery . 1. Carp will outcompete other species for food , an eat the weed . 2. Carp will colour the water with there aggressive feeding , , hence once water is coloured the weed will die , as it needs light to grow . Important to remember weed is rich in inverterbrates ie shrimps , snails water flees an all manner of things fish thrive on . Overstocked pool will lead to poor water quality , reduced growth rates , disease outbreaks and imbalance in food chain . Hopefully there may be only 1 0r 2 max carp in there ideally non its far too small . An tench an roach stocks will be protected which are both natural species to this country . Had walk round weekend the water looks bit tinged suggesting to me maybe too many fish in that may be stunted , not fished this pool but if too many carp in that’s the problem its just not big enough for carp . For the doubters any one can discuss this with EA fishery officers who will confirm what I have said above . I know this pool held a group of carp up to around 2010 but many haven’t been seen for years. A lot of bream have been put into this water, as back when I fished it between 2003/10 we never caught Bream. Only Roach, Perch, Pike and Tench. quite impressed that someone has taken on board to keep the pool clean an tidy . This is something I have done on every pool I visit if there is litter . An if every angler had the same view even if taking a small amount away in a carrier bag , cans quashed flat are very light to carry , an the little an often approach would keep the litter problem at bay in most areas .